Who does not love a fresh coat of paint on walls? Few home improvement jobs deliver as satisfying a return for your investment of both time and money. 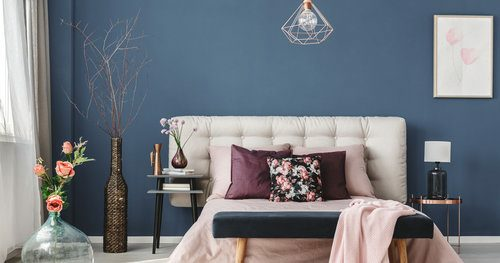 Whether you are refreshing an existing color or changing up the entire look of your room with a new hue, paint is a great way to make a room look great. But even this relatively simple task means having to make decisions. Do you want satin or flat paint? Both have advantages and disadvantages that we explore below. You need to consider the condition of your walls when deciding between satin and flat paint. If you are working with a new wall, professionally finished with a perfectly smooth surface, satin paint is a great option. However, if there are any imperfections in the surface, such as bumps, cracks, or holes that have been filled but still are visible, flat paint is a better choice. While the light will bounce off the more reflective surface of the satin paint and draw attention to bumps and divots, the matte finish of flat paint will not show every flaw. No matter whether you are using flat or satin paint, your walls need to be prepared for painting the same way. Once everything is removed from the walls and furniture is pulled away, the walls have to be thoroughly washed to remove all dirt, grime, and grease. Any loose paint needs to be scraped or sanded off, and holes must be patched to create as smooth a surface as possible. For a long-lasting paint job, it is best to use a coat of primer 1 first. Flat paint is much easier to apply than satin paint. Because it has no sheen, you do not have to worry about maintaining a leading edge of wet paint as you roll or brush on the paint. The most efficient way to cover a wall with flat paint is to quickly go over the walls with a roller in a zig-zag or W pattern, going back to fill in the gaps and touching up the edges with a small roller or brush. This can be repeated for one or two more coats. On the other hand, when using satin paint, you will end up with a mark on the wall if you apply wet paint over a dry edge. Using the W technique would leave many spots where the sheen is not even. 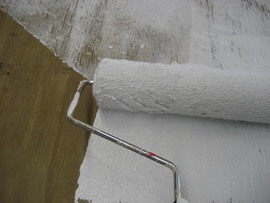 The best method is to load the roller with paint and apply the paint from top to bottom, one roller wide, and then reload the roller and apply the next strip of paint, overlapping the previous one slightly. That way there is always a wet edge to continue on from. Let us look at a basic paint job to see which costs more, satin or flat paint. We will use a 10x12-foot bedroom as an example that takes 2 gallons of flat or satin paint. Flat paint usually costs less, from $10-$45 per gallon or $20-$90 for the bedroom. Expect about 7 hours of labor, so if you are hiring a painter, that will cost you between $140-$245. Tools and other supplies add up to about $20. Primer 1 costs between $10-$35. That gives you a range of $190-$390 for completing this project with flat paint. Painting this same room with satin paint may add a couple of hours to the project because wall preparation can take longer to achieve a smoother surface, and painting may take longer. So, labor costs will be higher at $180-$315. Expect to pay anywhere from $20-$50 per gallon, or $40-$100 for the amount you need. Tools and primer 1 will cost from $30-$55. This project can be done with satin paint for $250-$470. These paint finishes are better suited to different spaces in the home. Ceilings are often painted in flat white paint because they are likely to have imperfections and are meant to be unobtrusive, which is accomplished with the matte, non-reflective surface of flat paint. Flat paint would also work well in a space such as a spare bedroom or home office, where there will be less chance of the walls needing regular scrubbing, which damages the surface. On the other hand, high-traffic areas like kitchens or children’s rooms need the more durable surface provided by satin paint. Satin paint also better resists moisture than flat paint, making it a natural choice for bathrooms. Satin paints are better than flat paints if they need to be cleaned regularly. Scrubbing flat paint is likely to remove some of the paint rather than just the dirt. The resins in satin paint do not just give it an attractive sheen but also create a tougher surface that can withstand scrubbing. This should be taken into account when choosing between satin and flat paint in your home. Save flat paint for walls that are not going to be exposed to the wear and tear of a high-traffic area. You will probably not have to repaint as often if you use satin rather than flat paint. Flat paint’s matte surface absorbs dirt and grime from the environment, while that same dirt can be more easily wiped or scrubbed off of a satin finish. If you want to get more years out of your paint job, opt for a satin finish. How much does it cost to use satin or flat paint for your walls in my city? Cost to use satin or flat paint for your walls varies greatly by region (and even by zip code). To get free estimates from local contractors, please indicate yours.